"This is a brilliant finale to one of spydom’s best series. If you haven’t read all the others, get them first and enjoy the whole feast." Berlin, 1948. Still occupied by the four Allied powers and largely in ruins, the city has become the cockpit of a new Cold War. The legacies of the war have become entangled in the new Soviet-American conflict, creating a world of bizarre and fleeting loyalties—a paradise for spies. As spring unfolds, a Western withdrawal looks increasingly likely. Berlin’s German inhabitants live in fear of the Soviet forces who occupy half the city, and whose legacy of violence has ripped apart many families. John Russell works for both Stalin’s NKVD and the newly created CIA, trying his best to cut himself loose from both before his double-agency is discovered by either. As tensions between the great powers escalate, each passing day makes Russell’s position more treacherous. He and his Soviet liaison, Shchepkin, seek out one final operation—one piece of intelligence so damning it could silence the wrath of one nation and solicit the protection of the other. It will be the most dangerous task Russell has ever taken on, but one way or the other, it will be his last. "Downing adroitly elucidates the morass that was post-World War II geopolitics without dumbing it down... One can only marvel at his talent for infusing such a rangy cast of characters with nuance and soul." "Downing is one of a trio of exceptional writers (Philip Kerr and Alan Furst being the other two) who have managed to re-create a time and place when much of the world seemed to have gone temporarily mad." "If your reaction is anything like mine, you'll want to continue through the entire series." "David Downing has created a complicated plot with many twists and turns while the hero seems caught in a maze." "This is a thrilling and suspenseful espionage series, one of the best being written today. One cares about Russell and his family and even the somewhat oily Shchepkin as they attempt to unravel themselves from the brutal and unfeeling intelligence services. It’s an extremely dangerous time and the likelihood for failure is high. If you like spy novels, you need to read all of the John Russell series." "I loved Masaryk Station. The plot in interesting, but the real point is the insight into the times. It provided insights and aroused emotions in me concerning my own experiences during the Cold War and helped build some perspective over the world events that I, in my youth, only knew asfact." "A wonderfully written mixture of history, espionage, and suspense. 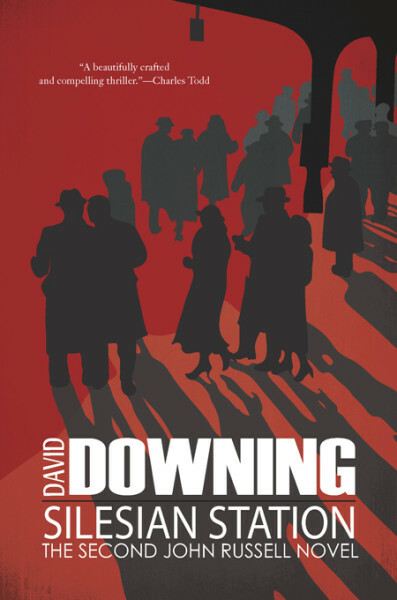 Downing perfectly captures post-war Berlin.... Intelligently written, provocatively told, and thoroughly convincing in every aspect, [John] Russell is a man who will not soon be forgotten by the readers of these books." "The book is a wonderful introduction to the Berlin Blockade, told through an exciting story with likeable characters."